Join Drs. 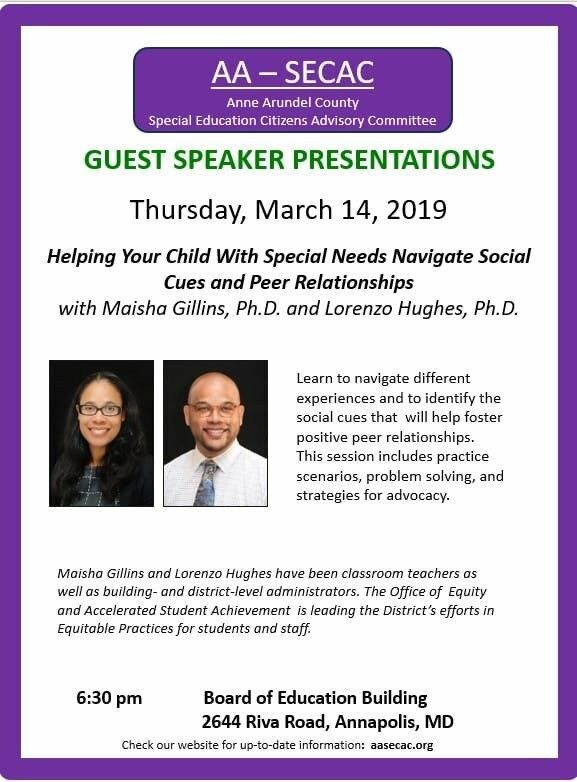 Maisha Gillins and Lorenzo Hughes for an engaging presentation about how parents can help their special needs children navigate different experiences and to identify the social cues that will help foster positive peer relationships. The presentation will be held at the Board of Education Parham Administration Building, 2644 Riva Rd in Annapolis on Thursday, March 14, 2019 at 6:30 p.m. This free event is sponsored by the AACPS Department of Special Education and the Special Education Citizens Advisory Committee (SECAC). MAKE YOUR VOICE HEARD! YOUR OPINION MATTERS! § "Partial sight" - visual acuity is 20/70 or less, in the better eye, after correction. Anne Arundel County Public Schools has recently updated its definition of students under the disability category of Visual Impairment, Including Blindness. In accordance with COMAR 13A.05.01.03B(84), a Visual Impairment is defined as an impairment in vision, which, even with correction, adversely affects a student's educational performance and includes both partial sight and blindness. Any impairment in vision, regardless of severity, is covered, provided that such impairment, even with correction, adversely affects a student's educational performance. Convergence Insufficiency, and other binocular visual disorders, are not excluded from the definition of Visual Impairment. Hello! 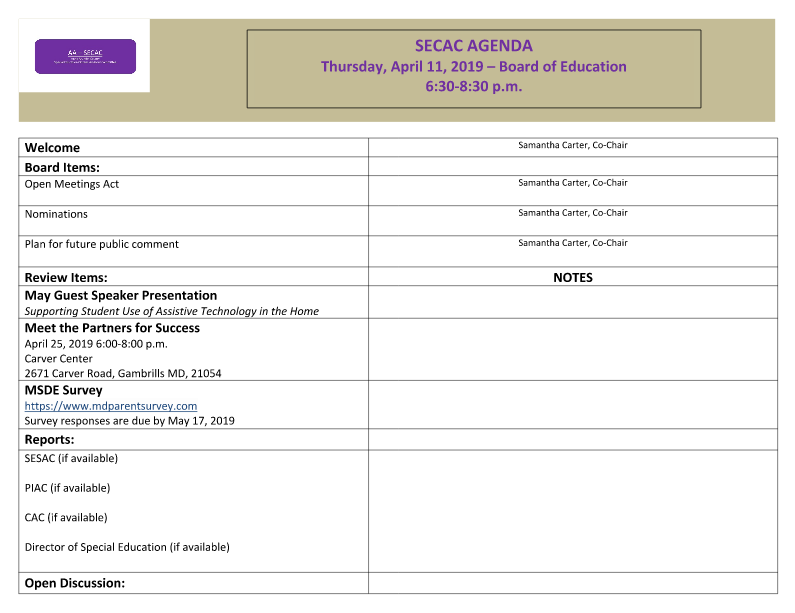 Anne Arundel County Special Education Citizens Advisory Committee is excited to kick off our 2016-2017 school year with a board planning meeting to be held virtually this Thursday, 11 Aug. Are you interested in specific topics for our speakers this year or helping work on one of our objectives to improve special education? We want to hear from you! Please submit your ideas to us via our Contact Us form. Our first general meeting of this year will be held Thursday, September 8 from 7-9pm at the The Dr. Carol S. Parham Board of Education Building, 2644 Riva Road, Annapolis, MD. Also, save the date for our annual resource fair, back to school night for Special Education, October 10 at Severna Park Middle School. Our updated meeting schedule for this school year has been posted. Please check back for updates on our speaker topics. We are looking forward to meeting you at one of our upcoming meetings or events! The US Department of Education, Office of Special Education and Rehabilitative Services published updated guidance on Free and Appropriate Public Education (FAPE) in November of 2015, which we are posting here for your reference. A copy of our flyer is included below.